Rolling terrain, buttes, mesas, grasslands, arid wilderness with a wide smooth shoulder to ride on with little traffic. This route rates up there with the Santa Fe to Tucomcari, NM ride I did on XC09. I did not know that this area was know for it's strong winds. Not that this would made any difference in my choice of rides. I did know that it would be hot but today the wind was out of the north bringing in cooler temperatures. When I rolled into Hot Springs a little afternoon the temperature was only 88. We stay in mostly 3 star hotels. Last night they said breakfast at the hotel was available at 5:30 but they would only have cereal. We would be leaving at 6:30. There was a local restaurant nearby that opened at 5am and I was the first one through the door. I did not get served until after 6 and by the time I finished packing many had already left on the ride. I started out riding alone hoping that the fast guys were behind me and I would hook onto them. The staff on this ride is able to ride every other day. Two of them come up and I ride with them. I do not know anything about there riding abilities. Soon, Jim , one of the mechanics drops back and I am riding with Karen. It's obvious she is a experienced rider. We arrive at the first SAG and the fast guys come in. Someone at the SAG tells me she is really fast and has been on podiums. We take off and I learn she rides 12k miles per year and has placed in the senior Olympics in time trials. At one point there was a 4 mile uphill with a grade of 5-7% and she has waited for me. From then on she mostly pulls me the 93 miles and we never saw another rider. A very nice ride indeed. I am losing it however. Exhibit 1. I had to wait 2 hours to get into my hotel room. I hop into the shower and it only has cold water. Not exactly what you want after a long ride. When I go to turn the water off I notice that in fact there was hot water, I had the handle turned the wrong way. Exhibit 2. There were no pictures taken after the first SAG. Why? I thought I had left my camera at the SAG when I washed my hands. Coming into Hot Springs I noticed that it was where it was supposed to be. 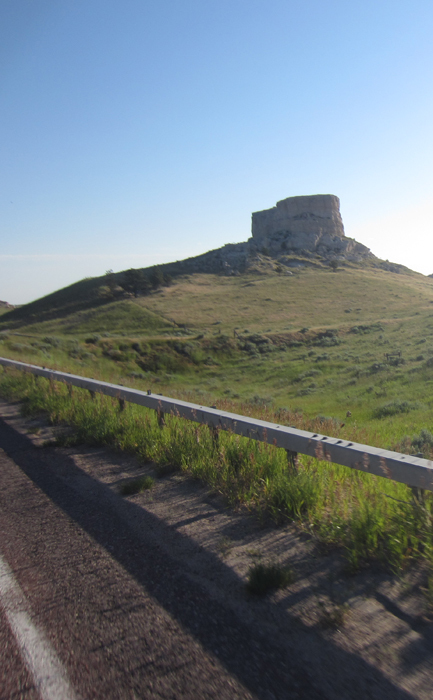 Tomorrow: 74 miles to Rapid City. We do go pass Mt. Rushmore so I will stop and take pictures. 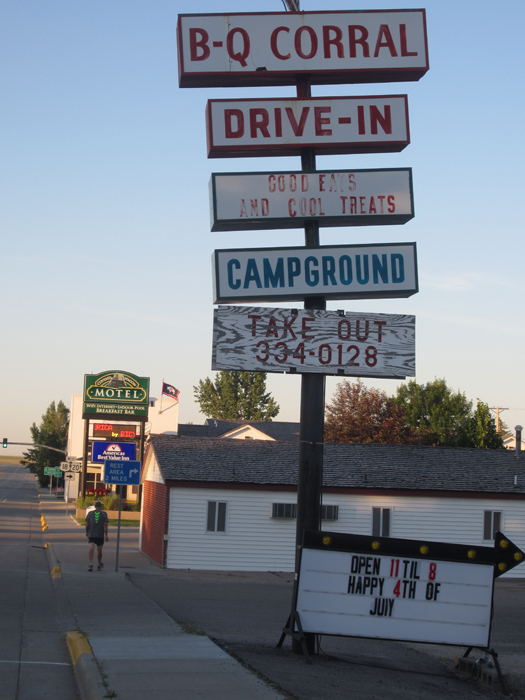 As of the census[ of 2000, there were 4,129 people As of the census[ of 2010, there were 3,711 people Hot Springs holds the annual Miss South Dakota pageant. Big news in Lusk. America by Bicycle has arrive. The best restaurant in town. 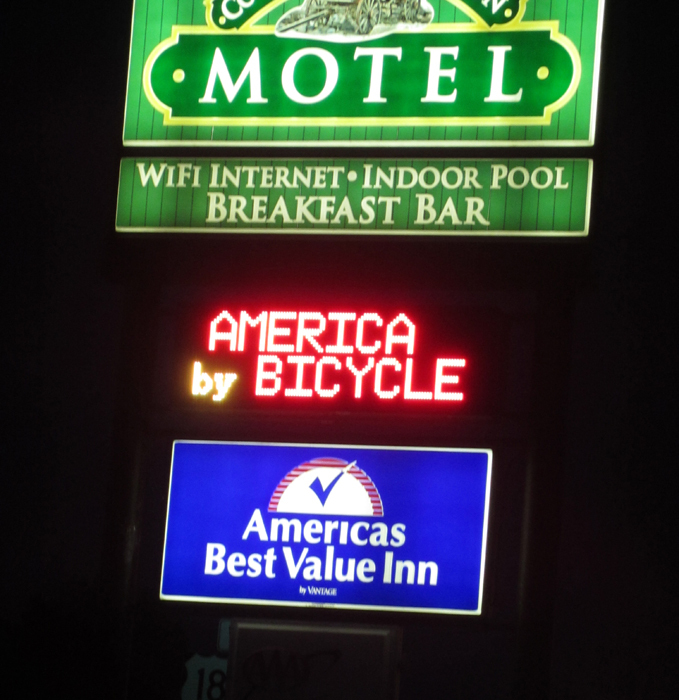 Directly to the right of the biker on the sidewalk are our classy hotel rooms. None of the bikers I have ridden with are doing a blog. If I am to take a picture I take it while riding. I do take them at the SAGS but today I mistakenly thought I had miss placed my camera. Another picture taken while riding. I have been wondering the purpose of the broken lines of fences we see constantly. I am told they are wind fences. I presume that you're keeping track of your food intake in TEUs - Taco Equivalent Units. OOPS!! Safe travels! Great pics! 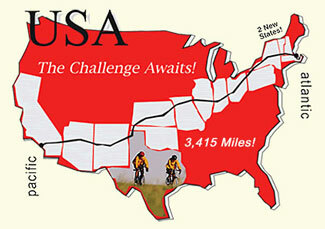 My goal is simply to VISIT all 50 states - you're making me feel like a real loser by biking all 50! I've only got ND and OR left - should I bike between those two? Have fun! So glad that you have high class accommodations. The fam came for dinner. We missed you.